I was really pleased to find this one - from the later, second leg of the the 1974 tour, an alternative gig to the gigs in Philadelphia which formed the official release David Live! with some different band members. Its a full soundboard recording - and of course, a complete live record of one gig, not a composite. It responded pretty well to some tarting up! I'm happy to say the remaster I did was downloaded nearly 2000 times in the time it was up, so thanks to all who grabbed it and spread the word. However, the link to this show has now been removed. Why? Well, it was released officially for the first time in 2017 for Record Store Day - and Tony Visconti himself remastered from the original tapes - while my remaster was a big improvement on the existing bootlegs, the gig will never sound better than with TV remastering it. And in keeping with my own thoughts on this - once the whole recording is released officially it comes off the archive. More info on the official release here. A new higher quality link should be up in the next week or two. Cheers! Thanks for the great show!RIP Ziggy Stardust. Rest in peace, indeed. Feel free to share the link out there. No, shows are remastered at 320 kbps mp3 only. Thanks, glad you're enjoying it. 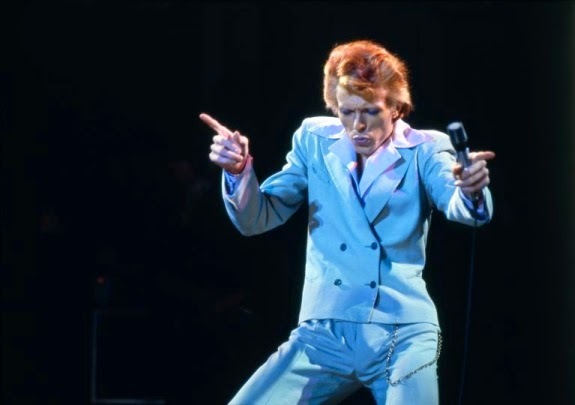 An amazing recording of the second (and much better) half of the Diamond Dogs/Philly Dogs tour of 1974. So much better than the awful (in comparison) "David Live" recordings. Cheers! Glad you've enjoyed it. I wondered if you had seen that there is an official release of this now, at least I think it is the same show. I didn't want you getting into trouble. Thanks as always for your incredible work. Hi, thanks glad you've enjoyed stuff here. I can't find an official release of this show anywhere - if you have a link, do let me know. Thanks! Actually - just seen it. A very limited release on vinyl for record store day. I'm not sure its the same show, can't find enough detail (there were 2 gigs I think in LA that week). If it turns into a regular release I'll take this link down, thanks for the heads up! Had a rethink - I understand Tony Visconti himself remastered the Record store Day release - who can compete with that! :) So about time this was retired - I'll leave the page here for reference. I just heard that it will be released on double CD soon too - I'm glad I got your version before the cash in from Parlophoney! As you say, I don't know if it is the same show, as I haven't compared it to the soon to be released version, but it would be odd that there were multiple live recordings out there. Thanks again. Yeah I'm sure its from the same source, ultimately. I've just pre-ordered the 2CD version myself. Being remastered by Visconti, it will be pretty definitive. Actually looking forward to hearing how much improvement he's made to it. Thanks for the kind words, and the heads up! Sorry to nit pick, but Tony Visconti remixed this - not a remaster. There is a huge difference. A remaster takes the stereo mix & tweaks that whereas a remix goes back to the multitrack tapes and starts fresh.